Vote for The Quilting Cupboard! Can we count on your vote? 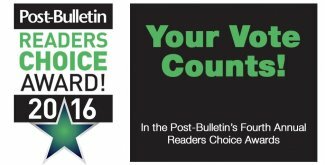 The time has come again to vote in the Post-Bulletin Reader's Choice & we would be honored to be chosen as your favorite quilt shop in Rochester! Anyone, anywhere, any age can vote! So easy to vote: Click the link or image to the right & enter your e-mail to get started! Vote for just one or as many categories as you like! Under category "SEWING CENTER", enter THE QUILTING CUPBOARD to vote for us! Easy as that!